maemo.org - Planet maemo: category "feed:a820b9e49de58112edb8309d290df351"
FriendlyARM is shipping the new Mini6410 for a little while now. It is based on a 533MHz clocked Samsung S3C6410. I do not want to repeat all the technical details here, an English description can be found here. Lets summarize the features in a simple sentence: It is fast enough for Qt and offers lots of ports for connectivity. It took me a while to get started with the blog again… so let’s start with something tiny: OpenEmbedded images for the Sim.One. So far we had quite some documentation about filesystems on external media but what about the internal flash? We have 8MB which is enough for a tiny filesystem we can build with OpenEmbedded. OE has support for the Sim.One already and I just added the parameters to build jffs2 filesystems for the internal NOR flash. In order to build jffs2 images for the Sim.One use the current org.openembedded.dev branch. The minimal-image is a good starting point for the internal flash. The image does not include much of functionality but leaves some free space for additional software. OE does not build the filesystem only, it builds the kernel for us as well so that we can start with a consistent set of files. Let’s give it a try and install the built results – I assume you have a U-Boot shell and network+tftp server configured already. I have set up the configuration of U-Boot in order to minimize te effort booting from some other medium. It works… what can I do now? Make the filesystem functional: Add useful things to the filesystem – a good candidate might be busybox httpd. Another useful target in OE is meta-toolchain which creates a cross compilation SDK for your device. Now that you have read the whole text: If you do not want to build yourself you can take a look at my build results. So what does this mean for developers and device manufacturers? One thing is for sure: The new platform will become the “grown up” version of Maemo and Moblin. Especially for the Maemo part this means that the focus will change from targeting a very few devices and a quite well-defined software stack to a more generic way to support multiple hard- and software environments. And this is good – only a portable and easy to support platform is attractive for the device makers while the availability of multiple devices is important for its attractively among software developers. Something was wrong with FOSDEM this year: The weather – it was (comparably) warm and the sun was shining all the time! Apart from this it was a great event like always. 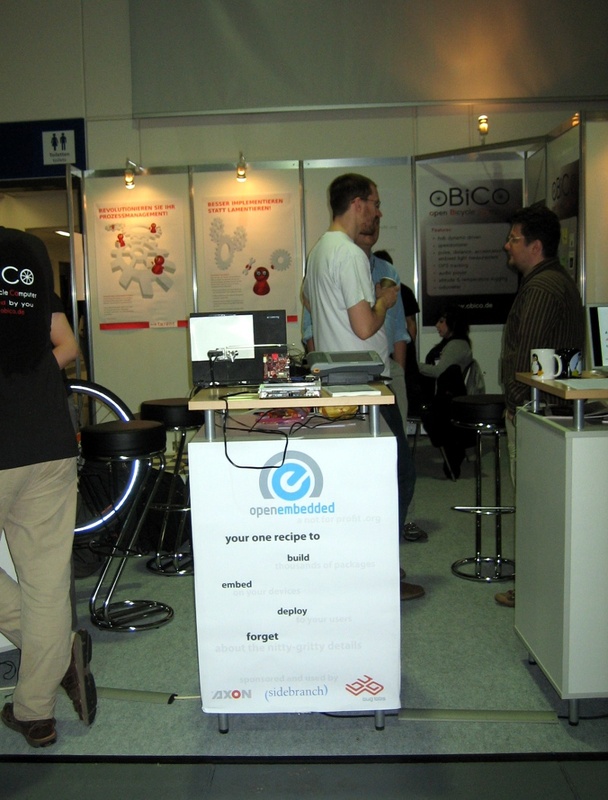 I attended it representing the OpenEmbedded project with a small booth. 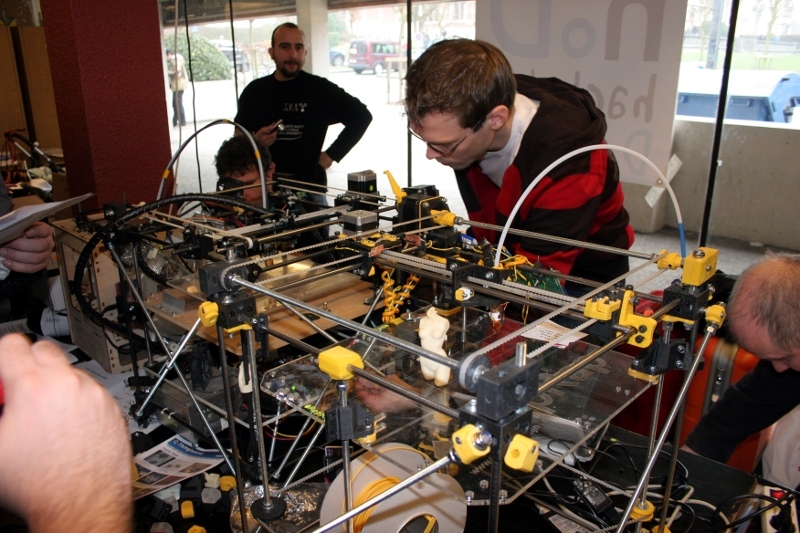 From the OE project perspective FOSDEM was a great success. Apart from meeting people working on other projects that do use or could use OE we had a lot of interest from various other visitors at the booth. Another thing I miss is a kind of poster or info sheet that summarizes OE achievements in some lists and numbers. But anyway I think we are getting better and become more and more popular. One more project / booth I think is worth to mention is Rep Rap / Makerbot. 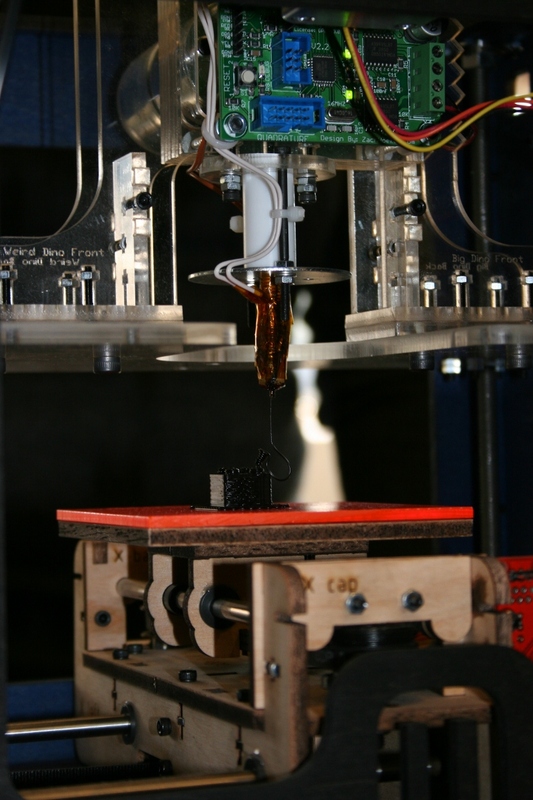 The bots for turning 3D models into real things you can touch and use gained quite some attraction. Did you notice? 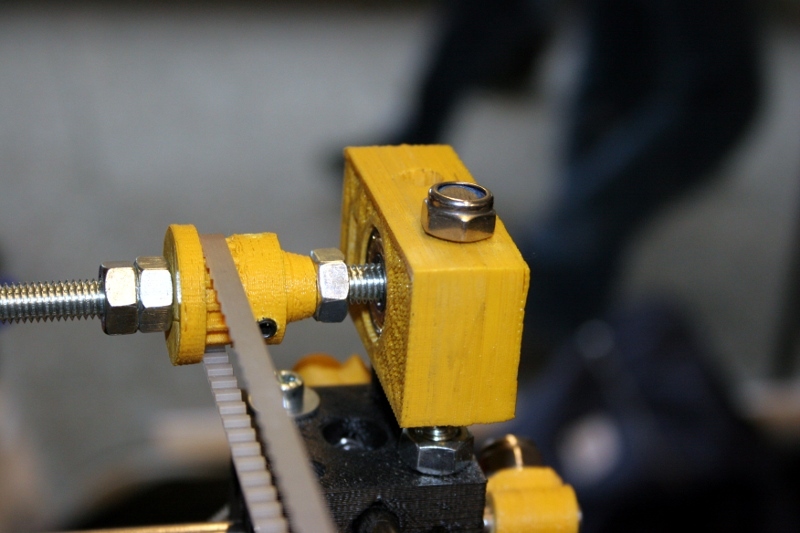 You can even use these bots make parts for another one… I think it is worth following these projects. They might become quite important to us in near future. I hope a few people wondered why my blog looked a little bit neglected in the past few months. Well finally I can say that I have been busy with several larger projects I was not supposed to talk about. For two projects I am involved in there are related press releases from our customers and business partners. One project is the Linux port to the Höft & Wessel skeye.pos mobile – I really like the press release because it mentions the fact the supplied devices are running Linux and what the devices are used for. The filesystem on these devices is built with OpenEmbedded and is based on an older Angström release. The other big project is closely related to both my job for kernel concepts and OpenEmbedded which is one of my favourite open source projects. The µCross distribution will support chip- and device vendors who are going to ship Linux-based solutions. The main idea is to combine the power OpenEmbedded and its large community with a good portion simplicity and a few additions. I do not want to mention too many boring details here so I will just introduce the basic concept: The idea is to offer customers binary packages matching their target architecture, matching toolchains and tools for assembling and configuring filesystem images for their devices. There is not really an offical announcement yet but one of our business partners just announced a nice SBC module which will come with a µCross-based SDK. ﻿The TK71 is a QSeven format module powered by a Marvell 88F6281 SoC (Sheeva core based). A third project that gained some love is the updated Linux port to the Toshiba Topas910 and TopasA900 boards. I am trying to maintain an upstream compatible and up to date Linux port to these devices here – for the people who do not want to use several year old kernels or this strange Aura stuff. The latest achievement is that I got some patches to make NAND flash work which is vital for the TopasA900 because its small NOR flash can’t keep a decent filesystem image with GUI. Ok now I’m done with showing off and I should return to do something useful… such as writing a short report about FOSDEM! I spent most of the time at the OpenEmbedded stand and even with enough OpenEmbedded people at LinuxTag I didn’t manage to attend a single talk. But the OE presentation was much better prepared compared to last year: We had a nice A0-sized poster with the new logo, Marcin brought 2500 printed flyers and we had adhesive tape. (Adhesive tape is useful because people in the neighbourhood of your booth are going to like you :-) Of course we had interesting devices to show: I collected some decices at home and at the office with the focus on useful devices to get started with embedded Linux (such as the BeagleBoard and a Micro2440). I built a kind of demo stand for the BeagleBoard and the PICO projector to reduce the cable and device chaos a little bit. It is made from an A5 advertisement sheet holder and a cellphone tripod. The photo shows the idea but most of the necessary cables are missing. We experienced some trouble with my old B4 BeagleBoard and latest filesystem images but the nice guys from the BeagleBoard/TI booth helped us out with a shiny new one – many thanks! The next important event for OE will be the upcoming OEDEM (the OE Developer Meeting). Please take part in the poll for the date when it should take place. We are still searching for a good location – in central Europe preferrably… suggestions are very welcome. PS: If someone has a good picture of the OE booth… I’d like to attach one here to this blog. I have always liked the idea to have an Anjuta plugin that simplifies the use of cross toolchains in order to develop for all sorts of mobile and embedded devices. Personally I do not rely on an IDE but I have worked with a lot of developers in the past who are not used to do application development with vi. The same applies to cross toolchains, but there are reasons why people compile natively or why tools like Scratchbox are developed. Some time ago OpenedHand published an Anjuta plugin for Poky that almost fits these needs – apart from minor lacks and the fact that you can’t use it with an OpenEmbedded build tree because it relies on the Poky directory layout. It didn’t take me long to modify the Poky plugin to fit the needs for OpenEmbedded: I have added automatic detection of the toolchain host prefix and some functionality to deal with the (not 100% fixed) directory layout of OpenEmbedded. So what does it do? It is easy to install (and build if necessary). I have created an initial website for it at KC Labs. You can find both source archive and binary packages for Ubuntu (9.04) and Debian Lenny. Once you have it installed it you should be able to design your GUI, fill it with functionality and deploy the application to a target device withouth leaving Anjuta. Feedback is very welcome – if you have ideas about new features or what you would like to see for cross development please let me know! PS: LinuxTag is approaching – visit the Embeded Area with projects like OpenEmbedded and Coreboot! Its time to make announcements… I should have done this earlier, but like always it takes me a while to find a free minute to write things down. While we are at the topic ‘evaluation and development hardware’… here here a few lines about a similar piece of hardware. I promised to do something with a FriendlyARM board already – so I did. I choosed the Micro2440 because the board itself is very small and can be used for own design easily. The very similar Mini2440 has a lot of ports on board in contrast to the 2mm headers of the Micro2440. Both boards are available through local distributors in Europe and the US now so that its not necessary to place orders in China any more. Watterott Electronic was so kind to send me a Micro2440 board and the SDK baseboard for evaluation. If you want to get started with embedded Linux the board might be exactly what you want: A 400MHz ARM9 based Samsung S3C2440A CPU which is pretty well supported by Linux. 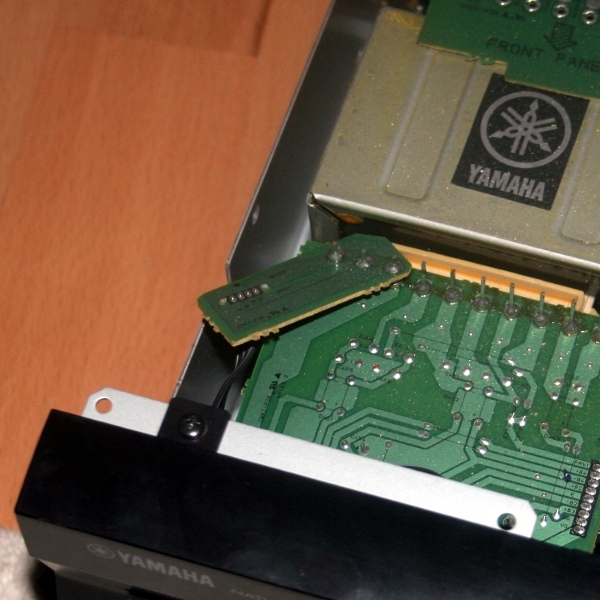 64MB od RAM and the same amount of NAND flash and 2MB of NOR flash for a backup bootloader. The baseboard has the connectors for the serial ports, USB host and client, display, expansion and SD and adds an audio codec and an Ethernet chip. There are two variants available: One with a 3.5″ QVGA TFT (pictured) and one with a 7″ 800×480 TFT. Both displays come with a touchscreen and in addition to this the board has a few buttons that can be used for a human interface. 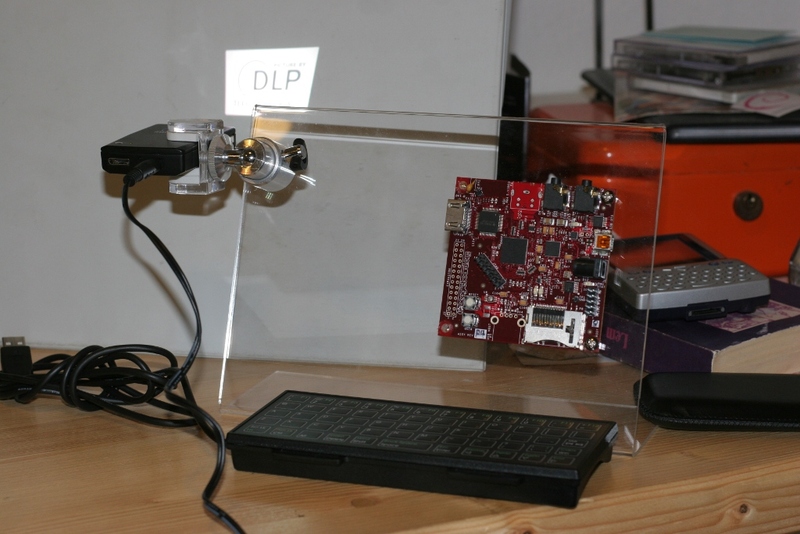 The whole SDK kit including Micro2440, SDK board, 3.5″ display cables and JTAG doesn’t cost more than 125 EUR incl. VAT which makes it even more appealing. The ‘softer’ part of the SDK quite appealing too: The hardware is pretty well documented, even the schematics are available to the public. FriendlyARM released some demo images and Linux sources that are useful (but not perfect). The ‘Vivi’ bootloader used by the boards can be replaced with u-boot easily so that you get a 100% Open Source embedded development environment. Thanks to the OpenMoko community the S3C is pretty well supported in Linux and u-boot. There is a public project providing up to date Linux, u-boot and QEmu supoort for these boards that can be found here. Like I usually do for a new piece of embedded or mobile hardware I used OpenEmbedded to built a GPE based filesystem image for it. Like you can see in the picture it works pretty well. For people interested in this I put together some notes I took and the binary images at KC Labs. Feel free to contact me about this… I plan to extend support for it a little bit and provide a toolchain and additional information. PS: Sorry for the bad image this time, I had to use the webcam to capture it. While the ongoing financial and ecomomic crisis seems to be the most popular topic for months now I try to make this blog a little more positive – some pice of contrast. I has been a little bit quiet around LinuxToGo for quite a while. We didn’t manage to do more than the absolutely vital administrative tasks and the machine suffered badly from the high load. But there are some lights on the horizon: First I seem to have a little bit of time to work on it again – I managed to sort out the worst I/O bottleneck caused by having all I/O load on a single disk. Thanks to Jay7 for the hints! I wrote a few lines about the server status and some statistics here. The second is that LinuxToGo has gained new sponsor: Bytemark Hosting sponsors a virtual server for us. Now we finally have the chance to distribute the load among two devices. Many thanks to Nick Thomas (lupine_85) for the idea and approaching us and his boss Matthew Bloch! There are quite some good news in the Maemo world as well. First is that the Maemo Community Council elections have started – active community members have the chance to elect the council till the end of March 19th. 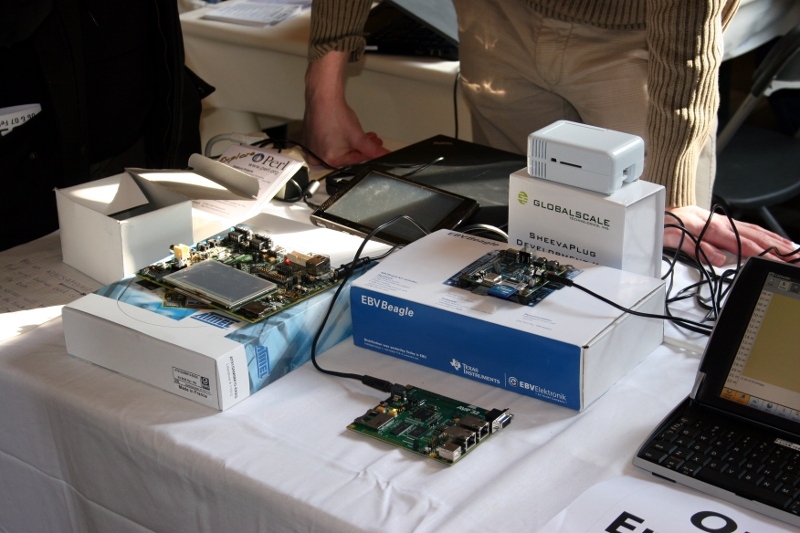 Mer, the community driven distribution project for Nokia Internet Tablets and some more devices seems to evolve more and more – there is a quite interesting article about it at LWN.net. The new Mameo 5 SDK Alpha release runs on BeagleBoard now too – Juha wrote a blog entry about this in the Maemo DT group blog. While we are on this topic already… the BeagleBoard has gained an interesting companion: The Leopard expansion board which comes with a camera and ethernet. I do not know much about it yet, but it is based on the TI DaVinci DM355. I’ll try to find out more and update the information here. I visited the Embedded World fair in Nürnberg on Wednesday this week together with some colleagues. Like always on events like this I stumble upon nice devices with Linux support… in fact embedded hardware like development platforms and devices for industrial use or consumer network stuff without running Linux seems to become uncommon. Just a few years back hackers had to search hard for useful devices or invest a lot of time reverse engineering consumer hardware. Unluckily cellphones are still problematic – even the linux ones are usually locked down so that they are not useful for developers. But let’s stay with the ‘good’ ones: Karo Electronics showed a new low cost DIMM sized embedded module based on a 400MHz ARM9 CPU (The datasheet mentions Freescale, but lacks the name the chip.) A friend bought a similar one (a TX27) which came with full Linux kernel sources. 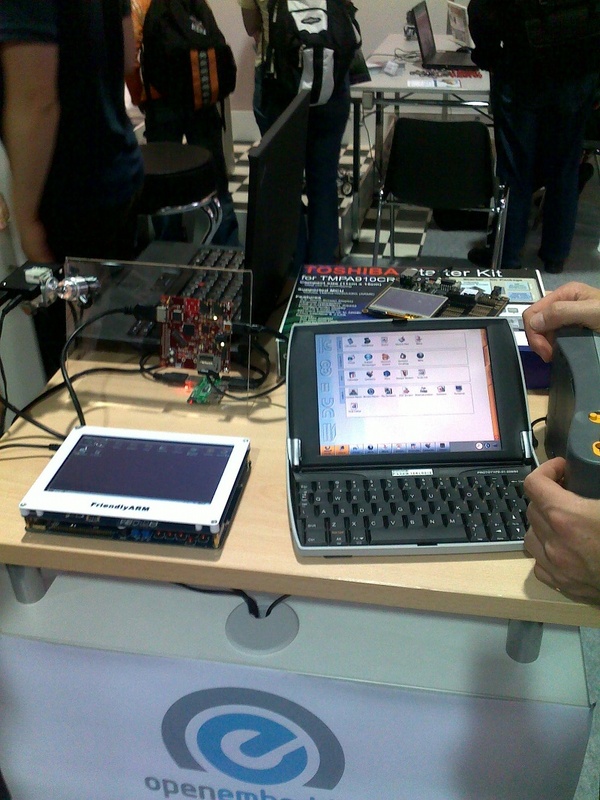 A real suprise was the booth of EBV: They build and sell their own BeagleBoard called EBVBeagle. Its actually a BeagleBoard revision C2 with green PCB boxed with some useful accessories. It comes as a quite complete starter kit with AC adapter, USB to Ethernet adapter, MMC card, USB hub and some cables. The official press release can be found here. They claim (but not gurantee) to be able to deliver within two weeks. Looks like the only drawback is the minimum order value of 250 EUR which is – of course – more than the EBVBeagle kit. 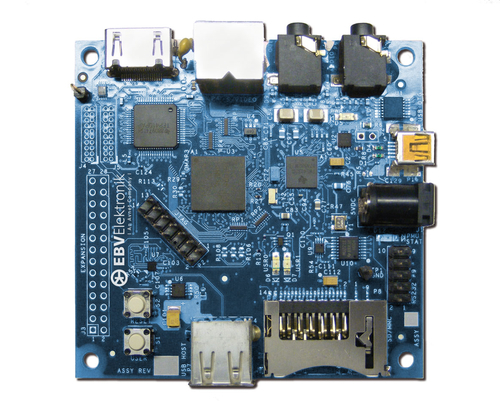 Apropos Beagle Board – Maemo (which runs on the BeagleBoard too) has released some new bits. First Maemo 5 alpha SDK is ready and released. This is pretty good for people using it on the Beagle Board because only the Maemo 5 SDKs support the OMAP3 SoC. For people who want to learn about Maemo development or development for Limux mobile devices in general there is a new Maemo Tutorial release. The Maemo Tutorial provides quite easy to understand and detailed information about Maemo platform and application development. It gives a lot of useful information about development for other Linux mobile device platforms as well.